The ACT Junior Chess League is in the thick of organising the various age and school championships in the nations capital. Last weekend the ACT Under 12 Championship attracted an excellent field of 67 players, which is quite an achievement given the crowded chess calendar at this time of year. On paper it was a very competitive event with a number of strong juniors taking part but the run away winner was Yijun Zhang who scored a perfect 9/9. In second place on 7/9 were Ethan Derwent (recent runner up in the NSW Open Under 1600 section), Willis Lo and Beven Lee. Jo Mason on 6/9 was the highest scoring girl, Glen Qi was the 'Young Champion', James Caffery had the 'top debut' and James Ashton won the 'rising star' award. "Chess for the love of it" isn't just a philosophy, it is also the title of a book written by A.R.B. Thomas in 1973. Part biography, part set of reminiscence's, part games collection, it covers his career from starting as a junior in 1915, participating in a couple of Hastings tournaments (where he played Keres, and Reshevsky amongst others) and even has the score of his game against an early computer chess program (MacHack VI) in 1968. In a sense A.R.B. Thomas was representative of the 'gentlemen' chess player, even going so far as to use his initials rather than his given names. Even in his own book he just refers to himself as A.R.B and I had to search the net to discover that he was christened Andrew Rowland Benedick Thomas. Thomas was a very sharp player and here is a fine win against the Argentinian master CE Guimard from 1937. Now the excitement of the Zonal has passed, it is time to remind you of the next big event. The 2009 ANU Open is a month away. Over the last couple of years this has become a very strong event, and this year should be no different. Soon-to-be GM David Smerdon has already entered the event, as well as giving a free simul on Friday 24th of July. Last years event attracted 96 players, and given the boom in numbers at a number of Australia weekenders, exceeding the 100 mark is a distinct possibility. The prize pool is a generous $3300, with $2200 on offer in the top section and $1100 in prizes for the Under 1600 event. The tournament is a 7 round event on the 25th and 26th of July using a time limit of G/60m+10s per move (Fischer). Entry fees are quite inexpensive, with $65 for adults and $40 for Juniors (for entries received before the 17th July). Sometimes the press releases just write themselves. Having saluted David Smerdon's GM title just last week, expect a new round of local publicity (in Canberra at least) with both David and Arianne Caoli winning the Open and Womens Oceania Zonals. Smerdon won the Open Zonal by a full point, scoring 7.5/9 with 7 wins, one draw (with GM Zong Yuan Zhao) and one loss (to Igor Bjelobrk). Caoli went half a point better, scoring 8/9, conceding draws to IM Irina Berezina and Sarah Anton (in the final round). David went into the final round holding a half point over the chasing pack, and wrapped up first place with a smooth victory over Tomek Rej. There are no points for style in chess. Whether you win brilliantly or ugly, it is still only worth 1 point on the scoreboard. And it is the same for losing. You can accumulate all the advantages in the world, but it only takes 1 move to throw them away. If the current zonal has demonstrated anything it is the 'Winning does not mean won'. Especially at the top end of the tournament there were a number of fortunate escapes where it seemed that clear advantages weren't enough to overcome title wielding opponents. The top two seeds seem to benefit especially, with draw offers being made by opponents in winning positions, and opponents walking into the only trick left in the position. A position from todays round of the Oceania Zonal. White to play and win. Of course I've timed my visit to the zonal so that the only full day I am here is for the rest day. This was actually deliberate because an important zonal meeting for all the Oceania federations was held today. I'll give a fuller report on that meeting in a future post, but I will say that it was a very interesting and informative meeting, with significant input from FIDE (the FIDE Secretary Ignatius Leong and the CACDEC Secretary Rupert Jones both traveled to attend the meeting) as well as all the Oceania Federations (well almost all). Even though there was no tournament chess today, there was a Barbecue at the Gardiner Chess Centre. GM Gawain Jones gave a simul, in which he won all his games, and there was a lighting event as well, although I failed to take note of the winner. It also gave me a chance to quickly look through some of the exciting chess already played, and I've found a particularly striking win by the current NSW Champion Greg Canfell. The stories you here about Queensland weather, totally untrue. I traveled up from Canberra to the Gold Coast today, flying via Sydney. As domestic flights go it was pretty uneventful, although the flight from Sydney was delayed by 40 minutes due to the weather conditions on the Gold Coast. As the plane came into land I could see why, as we basically came to rest in the middle of a lake. However a little water never hurt anyone (unless you happen to be interrogated by the United States of America), and the uncovered walk to the terminal was quite invigorating. I rolled into the venue about 6:30 pm with most of the games still in progress. As round 6 is often a key round in 9 round events, I probably picked a good time to turn up. My first shock was to see Igor Bjelobrk and James Morris on board 1. This was achieved when Bjelobrk defeated IM David Smerdon and Morris beat IM Gary Lane. This left the top seeds Zhao and Smerdon on boards 2 and 3. In terms of the key results the top 2 boards were drawn, while Smerdon beat Canfell. This leaves Bjelobrk, Morris and Smerdon on 5/6 with another 6 players half a point behind. Of personal interest to me was the performance of the PNG representatives, Joselito Marcos and Rupert Jones. As luck would have it they played each other in round 5, with Marcos winning. I might have been a good luck charm as they then scored 1.5/ in round 6, with Rupert Jones winning from 2 pawns down, and Marcos drawing. The saga of my computer upgrade is almost complete. It started Thursday and only now (late Sunday night) am I reasonably confident I've sorted everything out. The cause of the problem is Windows Easy Transfer. I understand that all the good programmers now work for Google, and the Easy Transfer program appears to have been written by a mob of poo-flinging monkeys, but surely Microsoft could have accurately named the program (ie "Crap software you have no choice but to use") as some sort of warning to the customer. As the heading of this post states, it is of course entirely my fault. I should have just torched Vista and installed Ubuntu on the new desktop, but both to support a few legacy apps (Chessbase etc) as well as to keep my family happy I did not. It would have been easier, and I would of course have a much more reliable and easier to use OS. Nonetheless, if you are going down the XP->Vista road here are a couple of traps that you WILL walk into. Firstly, the network transfer method is guaranteed to fail. Whether you connect it through a router or connect both computers directly, the network connection will drop out anywhere between 2 minutes and 18 hours after the process begins. And yes, the transfer is hellishly slow. Transferring 25Gb of data across a 100Mbit link took 18 hours to reach the 70% mark. The only way to continue is to stop the process. Then it helpfully tells you why it has stopped ('other machine not listening' or 'file permission denied') and suggests that you can skip the file and continue the process. Of course when you do, it simply continues to shut down. The other approach is to use an external hard drive. Fortunately I had 270Gb of free space on a spare drive, which should have been enough for the 25Gb of data I had. But NO. Firstly the program again falsely claims is will tell you how much space is needed for the transfer, but never actually does. The I kept getting a 'disk full' error when it had transferred about 15% of the files. I thought that maybe Microsoft were using some sort of file compression that increased the size of the data by 10000% but after a lot of searching I find that once again it was my fault. My drive wasn't full at all, but as it had been formatted as a FAT32 filesystem was failing at the 4Gb mark. Reformatting it as a NTFS file system was required. Once again an intelligent error message would have helped. Having finally transferred from one machine to another via an external drive (note: you can set a password on the transfer file to make it secure, but when loading it on the new machine it doesn't actually ask you for it) I discovered that some of the basic stuff such as email (from a non microsoft mail client) doesn't actually get sent across. I guess I shouldn't be surprised with this typical monopolistic behavior from microsoft, but hopefully a couple more billion dollar fines will make them see the error of their ways (but I doubt it). One final piece of advice. If you aren't willing to go to linux for you next machine I suggest you avoid this piece of software. Instead open one of those helpful emails from Russia that your virus checker complains about, and hope that it actually rips off your entire hard disk. Then contact the Russian Mafia and ask for them to send your data back to you. It will be quicker and cheaper than relying on microsoft. The first 2 rounds of the 2009 Oceania Zonal, and while most games have gone according to script, there were some lucky escapes. David Smerdon was worse for a long time against Eddy Levi in round 2, until Levi missed a trick and dropped a rook. GM Zong Yuan Zhao on the other hand had an easy win against Max Illingworth, after Max swapped off the wrong pieces and was left with too many weak squares around the king. Of the PNG players Joeslito Marcos had a draw in round one against Herman Rachmadi, before winning his second round game. FM Rupert Jones had a tough first round game against Igor Bjelobrk and suffered the effects of jet lag (he had flown in from England yesterday) in dropping his second game to Amir Karabasic. In the Womens Zonal top seed Irina Berezina dropped half a point against Vaness Reid in round 2, which is good news for her closest rivals. One of those players is former Australian Girls Champion Emma Guo, who scored the quickest win of round one in the following game. I've decided to get in early on the topic of 'Zonal' titles. By the end of the week I am sure another round of name calling and denigration will be in full swing on the various Australian chess bulletin boards, although it probably depends on who earns the IM title. I'll avoid that debate, both now and when it really kicks off. Doing some back of the envelope calculations I believe their will be between 12 and 20 players who will score 6/9 or more. This figure is higher than normal, but is simply because there are 72 players in this years Oceania Zonal, clearly a record field. So while in previous years there were only 1 or 2 players who reached the target score of 6, this year 6 or 6.5 may not be enough to secure the title. While this seem to make the title harder to achieve the larger field may result in some easier games in the first couple of rounds. So my predictions for the zonal are: 8 to win outright, 7.5 on tie-break between 3 players. IM Title to the first non IM/GM player to reach 7. As for who I think will win the event, I'll play it safe and tip Zong-Yuan Zhao (unless he loses to Smerdon during the event, when I'll shift my tip to David). Currently in the process of converting my 15+ years of legacy data to a new computer system. It is going as well as I expected, which is not as well as I hoped! The 2009 Oceania Zonal starts this Saturday (20th June). The Open Zonal has attracted a large and strong field with 68 players (as of this evening), while the Womens Zonal has a field of 17. Papua New Guinea has 2 representatives, FM Rupert Jones and Joselito Marcos. Interestingly 2 players eligible for the Womens Zonal have bypassed this event to play in the Open Zonal instead. For the first 3 days (Saturday to Monday) there will be 2 rounds a day, with the last 3 days (Wednesday to Friday) having 1 round per day. Tuesday is a rest day, with a lot of the day taken up with Oceania Zone meetings (for those that care for those things). I'll be making a flying visit to the tournament (arrive Monday afternoon, depart Wednesday morning) and hope to do some blogging from there. When I first started taking chess seriously I was fortunate that my parents brought me a small chess computer as a present. I was also fortunate that this happened in 1982, when chess computers weren't that strong. As a result I was able to improve my chess without having to rely on a chess coach, which may (or may not) have been a good thing. These days there is a huge amount of free coaching resource available. Another addition to the market is Peshk@ from the people at ChessOK. Actually only part of it is free (the interface and demo versions of course), with the full courses costing money. The full courses seem to be the same as available in the Convetka training series (Theory of Chess Endings, Opening Blunders etc), but I assume that will be cheaper than purchasing them as stand alone programs. It has all the same features as the Convetka software (Practice and Test modes, Elo tracking) but with an improved interface. I'll probably give it a proper work out in a week or 2, before deciding whether it is worth investing money in. The three rules of the opening are 1.Development 2. Central Control 3. King Safety. And yet even if we follow these rules, we can end up with sterile positions where neither side has any real play. Something therefore is missing. According to GM Ian Rogers, it was CJS Purdy who stated that one of the aims of the opening was to "create open files". And based on my experience coaching juniors, this is the missing ingredient. A crash course in open files can sometimes turn an average student into quite a tricky player. Of course some openings do not lend themselves to the rapid exchange of pawns (as in the game given 2 posts back), and players must either resign themselves to dull and drawish play, or else, take more radical steps. In the last round of the 2009 NSW Open Under 1600, Mario Palma was faced with exactly this choice. Although he had a couple of semi-open files to play with, his opponent had blocked them up. So he felt justified in sacrificing a piece to open up play on the queenside, and while it may not have been 'computer' sound, it did work in practice. Often the secret to success isn't waiting for the big rewards to come, it is doing the little things right. While the Australian chess community worries about the lack of chess 'culture' and publicity in this country, there seems to be less enthusiasm for actually remedying the situation. As an example, earlier this week IM David Smerdon fulfilled the requirements to become GM David Smerdon. Knowing that the ACT Chess Association doesn't have a publicity officer (although it probably should have one), I quickly sent out a press release about David's achievements as Caberra's first Grandmaster. Within 6 minutes of me sending it, the first request for an interview came through, from ABC Radio. Within 2 hours there were more requests for radio and print interviews, and a further request the following day. Now while Australian chess isn't going to get a new GM every week, there probably is enough chess news to send out a weekly press release. Certainly in Canberra, the ACT Junior Chess League (which does have a publicity officer) is usually able to get all the results of its junior events published in the junior sports section of the Canberra Times, by simply sending them the results. The underlying point of this post is that if organising bodies put there energies into the small stuff (publicity, membership management etc) then the big rewards will be easier to catch. In a previous post I published what would be my vote for the most boring game of chess ever played. Here is a challenger for that title, but for different reasons. In this 70 move classic, there isn't a single capture. Instead just a lot of piece shuffling with not a lot to show for it. Years ago I had a phenomenal piece of luck in finding a classic chess book. The book was David Bronstein's 'Zurich International Chess Tournament 1953' and I picked up a second hand copy for the princely sum of $2 from Skidmore's Junk Shop in the town of Temora, NSW. Actually it wasn't I that found it, it was my then girlfriend (Temora being her home town), and her ability to sniff out a chess book in amongst the piles of junk was one of the reasons I married her. However at some later stage I lent the book to a fellow chess player, and while I am pretty sure I know who it is, I'm also pretty sure I was never getting it back. So a lucky find became an unfortunate loss. That is until this week when I got a tip (not from my wife, but another generous chessplayer) that a copy was on the shelves of one of the many second hand bookshops in Canberra. Heading there at the earliest opportunity I was delighted to find it still available for purchase. I didn't get it quite as cheaply the second time around, but it was still a bargain at $11. And while I was happier to re-add it to my collection, I suspect my wife was happier still. A couple of weeks ago I posted a club game where the White king went for a wander across the board. Recently I purchased a book on the best games of Paul Keres (one of my favourite players) and was reminded of the fact that Keres was also fond of the wandering king. A lot of his early career games were played by correspondence, and often essayed the Steinitz variation of the Kings Gambit. 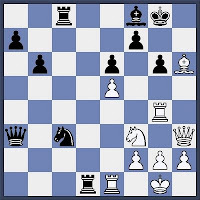 Here is a win against Soller from 1933, where his king deliberately goes to e2 on move 4, before heading for c1. I once won a game by checkmate after playing only 1 move. "Impossible" you say. In the normal course of affairs you would be right, but this wasn't a normal game. It was part of the Belconnen Chess Club's 'Gambit Allegro' which was a fun tournament we held once a year. The way it worked was that there would be an envelope containing slips of paper with opening variations written on them. As the tournament name suggests, these openings were all gambits, and before each game one player would reach into the envelope and pull out an opening. The game would then start with the specified moves on the paper. In one of my games the opening chosen was the From Gambit. So following the script we played 1.f4 e5 2.fxe d6 3.exd Bxd6 4.Nf3 g5 (D) This was where the moves ended, and as I was Black I started my opponents clock and awaited his first move. After a moments thought he played 5.h3?? which allowd me to play, as my first move of the game, 5. ... Bg3# In a sense, my quickest win ever. IM Mirko Rujevic and Erik Teichmann were the somewhat surprising winners of the 2009 Victorian Open. They both finished on 6/7, half a point ahead of GM Gawain Jones, IM Guy West, IM Stephen Solomon, IM-elect Igor Goldenberg, and Domagoj Dragicevic. Rujevic secured his share of first prize by holding GM Gawain Jones to a draw in the final round (an 81 move effort), while Teichmann defeated Eddy Levi. The loss pushed Levi back into a tie for 8th place, but he at least had the consolation of inflicting the only defeat on the tournament top seed GM Jones. The tournament attracted 95 players, which is one of the larger fields in recent years. What is also pleasing is that the NSW Open, held in Sydney over the same weekend, attracted a bumper field of 124 players. While obviously not Doeberl Cup sized fields, fields of this size do give organisers the flexibility to improve conditions and prizes in future years. While the results from the 2009 NSW Open aren't available on the web, it has been reported that IM David Smerdon has won the event with 6.5/7. More importantly, as the event is FIDE Rated, David's result is enough to move his FIDE rating over 2500, meaning that he has fulfilled the last requirement for his Grandmaster title. This makes David Australia's 4th* GM, after Ian Rogers, Darryl Johansen and Zong-Yuan Zhao and Canberra's first resident GM. Hopefulley more information on the tournament, and David's title will be available in the next few days. *There is an argument to include Walter Browne in this list, but that argument can be had by others. With the passing of John Hanks, the Australian Master Title has again become a topic for discussion. The title of Australian Master was created by the Australian Chess Federation in 1959, although the title itself was backdated to 1922. It was a point based system where players earned master points based on their performances in important events. It was a somewhat complicated and arbitrary system where players need to score a total of 100 points to earn the title, with a minimum of 45 points to be earned in the Australian Championship. How many points a tournament awarded was based on its category (A for Australian Championship, B for 'Important' events, C for State Championships, D for anything else with a time control slower than 20 moves per hour), and the number of Masters playing in that event. Only 1st to 3rd placing earned points, although this was dependent on finishing ahead of the masters in the field, with the caveat that a master who performed badly in a tournament would not be considered a master for the scoring of that event. I'm not sure why the system needed to be so complicated, but one explanation put to me was that Hanks wanted to make it as difficult as possible for certain players to earn the title. However the name given to me as player in this category (IIRC) is on the list of players who did earn the title, so I'm not so sure about this claim. By the time I became involved with the ACF in the later 1980's, the system had been replaced with a rating based system, similar to how the USCF awards titles. While this had the benefit of making the system simpler, it had the disadvantage of removing the gravitas of the previous system. This meant that the value of the title was so diminished that both earning the title wasn't acknowledged by the ACF, and receiving the title wasn't significant for the player. While serving as the ACF Ratings Officer I did make a proposal to revive the title using a norm based system (a la FIDE) but the ACF expressed little interest in it. For some reason the Ponziani Opening is making a bit of a comeback in the Canberra club scene. It has been played against me by 2 or 3 different players this year, although each seem to have their own treatment of the opening. A couple play it as a kind of delayed Italian (with c3 and d3), but at least one opponent is happy to head down the main lines. My working knowledge of the replies for Black extend as far as the advice Bill Hartston gave in an old opening book. "Black can play 3. ... d5 as after 4.exd Qxd5 the pawn on c3 prevents Nc3". However this simplistic approach doesn't always work as White has other alternatives to the capture on d5. One common line (after 3. ... d5) is 4.Bb5 pinning the knight. But never fear, Black can have some real fun in this line. According to John Emms' "Play the Open Games as Black" Black can sac some wood ( then get it back) and end up with an advantage. Here is his suggestion (which Fritz 9 quite likes as well). and the threat of e3+ leaves the advantage in Blacks hands. While most people regard Facebook as a device for stalking ex-girlfriends or a way of getting yourself sacked from your job ("How was I to know those photos would become public"), it can be a useful tool for chess bloggers. Every now and then I pick up 'insider' coverage of a chess event from one of the participants. For example Nigel Short is taking part in the Malmo event in Sweden and is doing quite well. He has won the first 2 rounds of this 6 player round robin, and he has kept his facebook friends informed with a 'One in a row' (after round 1) and 'Two in a row' (you can work this one out) messages. At the moment he hasn't embellished the messages with any analysis from his games, but I am sure that will arrive in New in Chess at some point in the next month. Here is his round 1 win over home town hero, Emmanuel Berg. The Correspondence Chess League of Australia (CCLA) have been busy recently organising a number of friendlies against other countries. The latest is against Scotland, and although it only started on the 15th of May this year, it is already 1-0 to Australia. Norton Jacobi, who was for many years the Games Editor for Australian Correspondence Chess Quarterly (ACCQ), achieved a position from the opening that favours White (heavily) and had no trouble in bringing home the point. Those who both read this blog and ACCQ , will note that Norton is making a habit of demolishing opponents in the French, as he had another quick win (using the Alekhine-Chatard) published in the latest issue. Via a source in the International Go Federation (IGF) comes news of the next World Mind Sports Games (which was last held in China in 2008). Firstly it has been decided to shift the next Games to 2013, so as to avoid a clash with the real Olympics. This has the added benefit of avoiding a clash with the Chess Olympiad as well, which certainly affected the turnout last year. Secondly the list of bidding cities for this event is an interesting one. The Middle East has both Abu Dhabi and Dubai, while China has Hangzhou. But the real surprise in the pack is Adelaide, Australia! My source didn't know who was behind the Adelaide bid, but surmised it might be the Australian Bridge Federation. I'm inclined to agree with him, but you never know. The Australian Chess Federation may have found that elusive big dollar sponsor they have been looking for after all. I saw an announcement yesterday (don't ask me for the link) about new content from Google. For Canberran's, and visitors to the Doeberl Cup etc, Google Maps will soon include bus timetables for the nations capital. For budding chess historians, something better. Google is planning to provide archival issues of The Sydney Morning Herald and The Age, going back to the 1840's. So no more digging around musty old newspaper rooms at the National Library to find what you are looking for. Of course Google already provide this content from other newspapers, including the New York Times. If you click on this link, you will even see a story concerning the Staunton v Morphy non match from 1858. While Australian chess tends to come together over Easter for the Doeberl Cup (with the exception of minor events in Queensland and Western Australia), the Queens Birthday Weekend in June is almost the complete opposite. New South Wales, Victoria, Queensland, South Australia and Tasmania all take the opportunity to run their own chess events. With Western Australia holding their Foundation Day event the weekend before, it is only the ACT that keeps this time of year free of weekender chess. The two big events are the NSW Open and the Victorian Open. Both events attract a strong field from their own constituencies, although the NSW event is benefiting from an influx of ACT players. Top seed at this stage is IM David Smerdon (from Canberra of course). The top seed for the Victorian Open is current Melbourne resident, GM Gawain Jones. There is also a strong collection of IM's, with Stephen Solomon making the trip from Queensland to play in the event. If you want to catch the results from these events (at least after they've been completed) then the Yulgilbar-Think Big Grand Prix page is probably the best resource.